If you are ever going to visit Italy, or even if you are travelling to Europe, that might be your best chance to buy this delicacy. Bottarga is a typical product from Sardegna that gained popularity beyond its original region over the past 25 years. Unfortunately, to date I am not aware of an outlet where bottarga can be bought in Singapore. This is a fairly expensive product, priced at about 10 euros for 100gr. However, it's worth every penny. There are 2 varieties of Bottarga: Muggine (grey mullet) and Tonno (tuna). The best one in my opinion is the Muggine bottarga, because of its delicate flavour. Bottarga is nothing but the eggs of the fish, treated and dried. The texture is soft and the flavour subtly fishy. 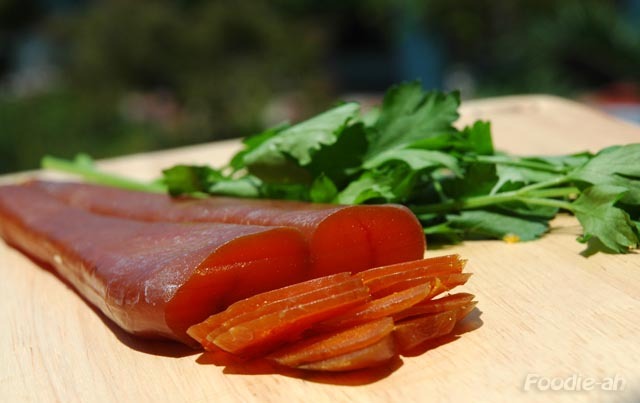 Funnily enough Bottarga can also be purchased in Japan or Taiwan, as they have their own equivalent! The exact same product is called Karasumi in Japan, and it is a typical product of Kyushu. Having tried both, I would say that Bottarga is sweeter while Karasumi is darker and has a slightly smoky flavour. This wonderful delicacy can be enjoyed in various ways, however it is most commonly eaten fresh, thinly sliced with bread and either butter or olive oil. The other way to enjoy Bottarga is on pasta, and I have already posted the recipe on this blog. In order to have Bottarga on pasta, it is highly recommended that you 'age' it by storing it in a refrigerator removed from its vacuum package and wrapped in kitchen paper for about a month. Should you come across a place in Singapore where this can be bought your advice will be very welcome, otherwise do buy one of these on your next trip to Italy, Europe, Japan or Taiwan! Aaahh, I have been intrigued by bottarga for a while. Le Papillon (now defunct) had a much raved-about rigatoni blessed with shaved bottarga. That is a gorgeous photo. Did you buy this bottarga from Europe/Italy then? I must now track down some karasumi...I think it should be available here. Thanks for the informative post! It's great to hear that there is knowledge and interest in these gourmet ingredients! Yes, I bought this from Italy on my last trip in October last year and I have enough to feed an army for a year or so :) I have been hunting around Italy for the best price and ended up buying this in Bologna. However, if you do find karasumi, please do let me know! I would rather know that I CAN get it locally! I finally found where Bottarga can be found. At the basement of Liang Court, at the Italian delicatessen right in front of the entrance to the food market. Your version of bottarga pasta looks great! Cugini was disappointing. Please do try Hiro Primo's karasumi pasta when you visit Tokyo next time,they are the best so far! Yes, my post is very old and of couse outdated. I buy my Bottarga in Italy nowadays so I can't advise on where to find it, but I'm glad you found a place in the end! I hole you will do well with your pasta, it may take some time to master.